There's a Spring In My Step! Well Spring has arrived, but unfortunately it still feels like winter up here in the Northeast. We still have snow on the ground, and we are happy if the temperature gets up to 45 during the day. Thankfully, the weather doesn't have to be the only reason to have a spring in my step! A few of us have joined together to celebrate spring with you. 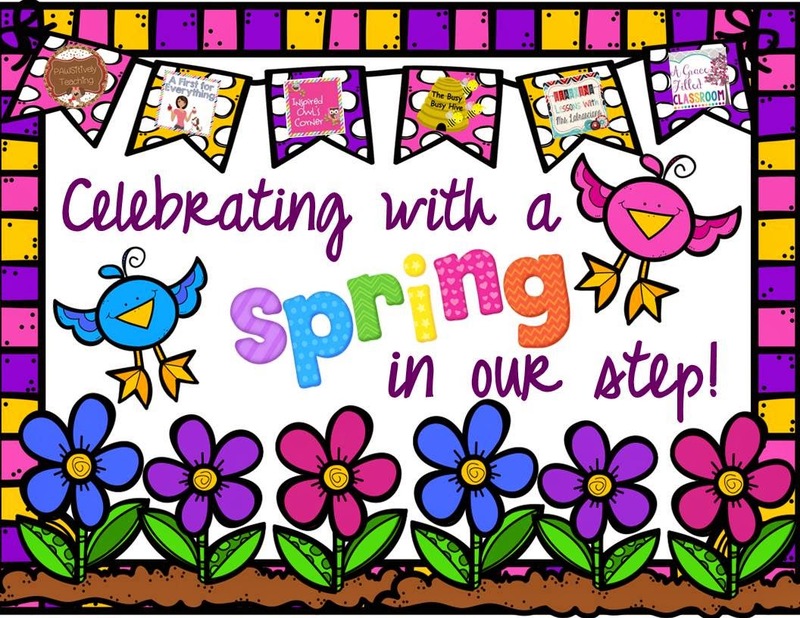 We have linked up to bring you spring ideas, spring freebies, and a huge spring giveaway! My favorite spring celebration is definitely Easter! I love taking a day or more to celebrate and remember the miracle of Christ's resurrection. Of course, I enjoy the beautiful decorations and dinner with family, but even more than that I love being reminded of the great gift that God gave us through his Son. I like what Paul says in I Corinthians 15:17, 19 - "And if Christ be not raised, your faith is vain; ye are yet in your sins. If in this life only we have hope in Christ, we are of all men most miserable." I have to admit that spring is always the time when I start to think about next year. I am in a small school which means that I usually know the students who will be in my grade next year. I know what they struggle with and what they excel at. My compulsive need to plan everything kicks in, and I start to focus on next year. I reread my goals and reflect on whether I have helped my students meet those goals. If they haven't, I make a concentrated effort to work on those topics for the rest of the year. And if they have reached the goals, then we have a reason to celebrate! Since Easter is my favorite spring celebration, I have decided to share my newest Easter product with you. This is a paid product in my TPT store, but I am letting you have it for free! 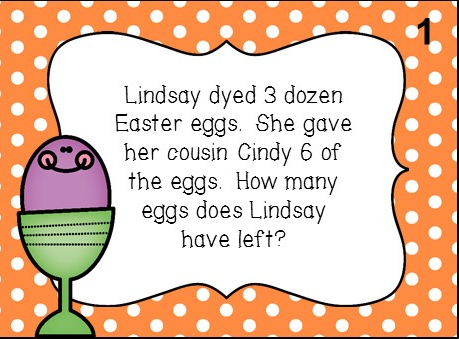 These 2 step story problem task cards will hold your students interest with stories about Easter eggs, candy, and egg hunts. Each story problem used simple numbers so that the focus is on determining what steps to use, not struggling with the actual math work. You can pick up this fun task card set by clicking on the link above. Don't forget to enter the giveaway and follow the links to pick up some other great spring freebies and ideas! I am always thinking about how I will change/improve things next year. It's a hard balance to keep. Staying focused this time of year is particularly difficult. Your task cards are adorable. Five for Friday: Happy Spring!